One reader writes in the letters section as to why he and his family marched at the AUOB Scottish Independence rally in Edinburgh. I had a lovely family day out in Edinburgh on Saturday. We marched, not as Nats or even separatists or any other insulting tag the rather unpleasant side of the No campaign use in a crass attempt to discredit those who support Scottish independence. We marched because of a failing Union a devolved Scotland can’t do much about. My family are simply fed up being ruled by a Tory Party the Scottish electorate constantly ­reject and now, to cap it all, being taken out of the EU when an overwhelming 62 per cent voted to remain. I can hear the howls of protest from No supporters already. They don’t get this democratic deficit because they are schooled into a narrow, simplistic response: ‘Scotland took part in the EU referendum as part of the whole of the UK’. What they refuse to even attempt to understand is that many people in Scotland no longer wish to be part of a whole they no longer find wholesome. So, what can we take out of the tens of thousands who took part in a carnival that had Edinburgh buzzing? Well, Nicola Sturgeon must have ­uttered a sigh of relief that her tenure looks reasonably safe, whereas Ruth Davidson’s well worn assertion that there is ‘no appetite’ for a second ­referendum has been shattered. So, what about Richard Leonard floundering in third place? Like Jeremy Corbyn he opposes ­independence, which is fair enough. But, unlike Corbyn he appears to have shot himself in the foot by opposing a second referendum. 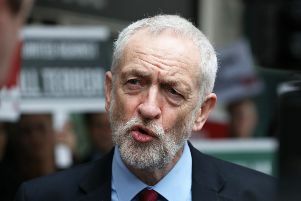 In effect, instead of putting clear distance between ­Labour and the Tories, Leonard is ­ignoring the material change in Scottish politics that many ex-Labour supporters now support independence. Winning them back to the fold will be a major task I personally do not think he can achieve. Sturgeon can only be uttering another sigh of relief as Leonard scores another Labour own goal.